Objectives: Human tracheal allotransplant is an option for treating long-segment tracheal defects, but no reliable and satisfactory tracheal transplant procedure has been developed. The purpose of this study is to review the results of 2-stage tracheal reconstruction in human tracheal allotransplant for tracheal defects > 5 cm with the use of greater omentum for revascularization. Materials and Methods: There were 3 patients who had tracheal allograft. In stage 1, a segment of donor trachea (6 cm) was excised and wrapped in the recipient greater omentum. In stage 2, at 3 to 5 weeks after stage 1, the tracheal allograft and omental pedicle were orthotopically transplanted to the cervical part of the trachea. All patients received immunosuppression with tacrolimus, mycophenolate mofetil, and methylprednisolone. Fiberoptic bronchoscopy was performed monthly during the 6 months after stage 2. Results: In all 3 patients, no major postoperative complication was observed. Transverse section of the donor trachea showed a mechanically stable chondral framework. Histologic sections stained with hematoxylin-eosin showed complete cartilage rings covered by intact respiratory epithelium. Conclusions: A 2-stage procedure for human tracheal transplant with greater omentum is a safe and effective technique for tracheal reconstruction. In an experimental model in dogs, a 6-ring segment of trachea was resected, wrapped in the recipient’s greater omentum, and reconstructed by end-to-end anastomosis; therefore, this method is feasible and can facilitate the survival of a tracheal graft.8 In addition, a 57-year-old patient who had low-segment tracheal stenosis was alive at 31 months and achieved stage 0 bronchiolitis obliterans syndrome after a 1-stage tracheal reconstruction with the use of human trachea wrapped in the greater omentum.4 Therefore, we decided to reconstruct a long-segment tracheal defect > 5 cm with 2-stage surgery. The allograft was revascularized by heterotopic wrapping in the recipient’s greater omentum. The purpose of this study was to review the results of 2-stage tracheal reconstruction in human tracheal allotransplant for tracheal defects > 5 cm with the use of greater omentum for revascularization. Between November 2011 and June 2013, there were 3 patients who were referred to The First Hospital of Beijing University for surgical treatment of tracheal defects. The defects were caused during treatment for recurrent stomach cancer (cardia of stomach), (1 patient), primary esophageal carcinoma (1 patient), and tracheal adenoid cystic carcinoma (1 patient). All patients were men aged 50 to 62 years (mean, 54 y). All patients had preoperative tests including blood group testing, electrocardiogram, echocardiogram, blood gas analysis, pulmonary function tests, fiberoptic bronchoscopy, contrast-enhanced chest and abdominal computed tomography scanning, and positron emission tomography as needed. The study was approved by the Ethical Review Committee of the institute. All protocols conformed with the ethical guidelines of the 1975 Helsinki Declaration. Informed consent was obtained from all subjects. An 11-cm long trachea from a deceased male donor with the same blood group as the recipient was delivered to our sterile unit in University of Wisconsin solution on ice. The tracheal graft was trimmed to ensure the structural integrity of the tracheal cartilage ring and good coverage of tracheal mucosa before being trimmed (length, 6 cm). The donor trachea was closed at 1 end using interrupted 3-0 silk braided nonabsorbable sutures (Figure 1). After a small left middle laparotomy, the distal part of the greater omentum was brought out from the peritoneal cavity (Figure 1). The tracheal allograft was wrapped with the lower portion of the greater omentum (Figure 1), which was sutured with single 4-0 polydioxanone sutures (Ruesch Company, Kernen, Germany) to have close contact with the trachea. A 2-cm incision was made along the mid-abdominal line, and the open side of the donor trachea was wrapped with the greater omentum and fixed to the abdominal wall with 0 silk braided nonabsorbable suture. This was performed to facilitate good revascularization of the graft and clearance of secretions after surgery. The incision was closed after a 24-French silicone rubber catheter was inserted into the tracheal lumen to prevent tracheal collapse and contraction (Figure 1). Postoperative immunosuppressive therapy included tacrolimus, mycophenolate mofetil, and methylprednisolone. The tracheal allograft stoma was carefully nursed daily to clean secretions and inspect the mucosal epithelium to ensure normal tracheal appearance. Stage 2 surgery was performed at 3 to 5 weeks after stage 1. In stage 2, the patients had esophagectomy, gastrectomy, or tracheal resection to treat their primary diseases and remove the invasive tracheal tumor (Table 1, Figure 2).9-11 The anastomosis between the distal trachea and donor was performed with continuous polypropylene suture (4-0 Prolene, Ethicon, Somerville, NJ, USA) (Figure 2). Elective intraoperative ventilation was performed in all 3 patients to evaluate for anastomotic leakage. A 20-French chest tube was inserted for drainage, and the thoracoabdominal incision was closed. Patients were recovered from anesthesia, extubated, and monitored white blood cell count and serum biochemical index until resting comfortably. Oral prophylactic antibiotics were administered for 7–9 days. Subcutaneous or intra-muscular buprenorphine (0.01–0.02 mg/kg) was administered every 12 h for analgesia as needed. The patients received long-term immunosuppressant (anti-rejection) drugs. Fiberoptic bronchoscopy was performed monthly during the 6 months after stage 2. All 3 patients underwent tracheal allotransplant (Figure 3). No major postoperative complication was observed. The mean operative time was 18 hours; mean blood loss was 667 mL; mean mechanical ventilation time was 101 hours, and mean intensive care unit stay was 7.3 hours (Table 2). 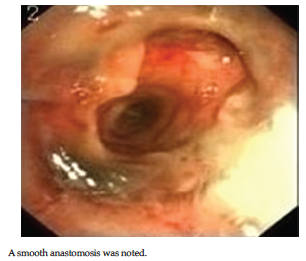 Postoperative fiberoptic bronchoscopy showed that the tracheal anastomosis was well healed, and no symptom of bronchiolitis obliterans was detected (Figure 4). Transverse section of the donor trachea at the beginning of stage 2 surgery showed a mechanically stable chondral framework, and histologic section stained with hematoxylin-eosin showed complete cartilage rings covered by intact respiratory epithelium (Figure 5). The blood supply to the trachea makes it unsuitable for direct revascularization. Therefore, most previous attempts at tracheal transplant had been performed after indirect revascularization. The first tracheal allotransplant in a human was reported in 1979, but no information about the viability of the allograft and long-term clinical outcome was provided.12 Several other investigators introduced omentopexy that was applied to tracheal transplant in a 1-stage indirect revascularization, but 11 of 13 tracheal autografts had ischemic necrosis or disintegration of cartilage rings.13 In 1993, a 1-stage tracheal transplant with omentopexy was performed in a 24-year-old woman for treatment of idiopathic fibrosing mediastinitis that affected the thoracic segment of the trachea; however, early rejection occurred 10 days after transplant and progressive stenosis occurred 4 months later that was treated with permanent stenting of the trachea.14 It is most important to have an immobile contact between the graft and its surrounding vascular bed during tracheal graft revascularization. We deduced that ischemic shrinkage was inevitable because the tracheal graft cannot be motionless and some vital movements from respiration or swallowing cannot be stopped. Therefore, 2-stage tracheal allotransplant was required to ensure good tracheal graft revascularization. In 1994, a 2-stage tracheal transplant was described in rabbits using a fascial flap.5,15 The tracheal graft was implanted heterotopically into the lateral thoracic fascia for revascularization, and the graft was orthotopically transplanted into the trachea; the results were successful, and the optimal time for the second stage was 2 to 3 weeks after the first stage.5,15 However, this technique was not applied to humans. In this study, we used a 2-stage tracheal allotransplant with greater omentum in 3 patients. The recipient omentum allowed a good blood supply to the donor trachea. Macroscopic results showed a mechanically stable chondral framework in the donor trachea. In addition, microscopic findings showed complete cartilage rings covered by intact respiratory epithelium. We selected a 2-stage approach because the application of tracheal allograft wrapped with the greater omentum was safer than reimplanting it with an omentopexy. No adhesions in the peritoneal cavity were observed in the present study. Good revascularization was achieved because the greater omentum possessed a rich vascular supply for the donor trachea and it has the advantage of growing and extending. Excessive anastomotic tension and ischemia may be responsible for anastomotic stenosis. Therefore, during stage 1, a 24-French silicone rubber catheter was inserted into the tracheal lumen to prevent the trachea from collapsing or forming a longitudinal contracture. In addition, immunosuppressive therapy was given to ensure that the allograft survived at the end of stage 1. The dose of immunosuppressive drugs may be reduced if the recipient tracheal mucosa may extend to cover the donor cartilage rings. During the stage 2, the donor trachea should be long enough to minimize anastomotic tension, and the anastomotic stoma is embedded by the residual greater omentum to alleviate injury induced by ischemia. Furthermore, this method can improve the viability of the donor trachea. Follow-up fiberoptic bronchoscopy revealed that the tracheal anastomosis healed well, and the patients had no symptoms of bronchiolitis obliterans. In summary, this study established human tracheal allotransplant and omentum wrapping in the abdomen in a 2-stage procedure. All necessary prerequisites for a final transfer of the graft into the orthotopic position were sufficiently achieved. All donor tracheas survived and achieved good vascularization. Therefore, this surgical approach may serve as a model for planned tracheal transplant in treating various types of tracheal problems. Grillo HC, Donahue DM, Mathisen DJ, Wain JC, Wright CD. Postintubation tracheal stenosis: treatment and results. J Thorac Cardiovasc Surg. 1995;109(3):486-493. Pearson FG, Gullane P. Subglottic resection with primary tracheal anastomosis: including synchronous laryngotracheal reconstructions. Semin Thorac Cardiovasc Surg. 1996;8(4):381-391. Wright CD, Grillo HC, Wain JC, et al. Anastomotic complications after tracheal resection: prognostic factors and management. J Thorac Cardiovasc Surg. 2004;128(5):731-739. Klepetko W, Marta GM, Wisser W, et al. Heterotopic tracheal transplantation with omentum wrapping in the abdominal position preserves functional and structural integrity of a human tracheal allograft. J Thorac Cardiovasc Surg. 2004;127(3):862-867. 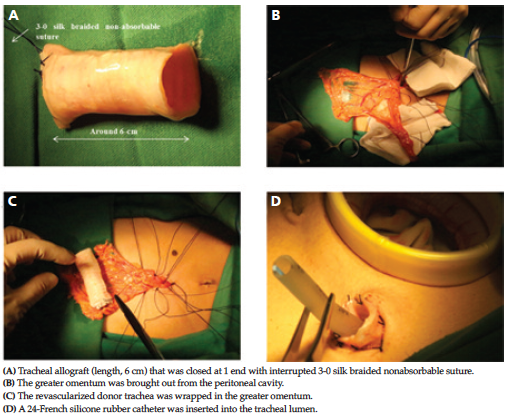 Delaere PR, Liu ZY, Hermans R, Sciot R, Feenstra L. Experimental tracheal allograft revascularization and transplantation. J Thorac Cardiovasc Surg. 1995;110(3):728-737. Delaere PR, Liu Z, Sciot R, Welvaart W. The role of immunosuppression in the long-term survival of tracheal allografts. Arch Otolaryngol Head Neck Surg. 1996;122(11):1201-1208. Salassa JR, Pearson BW, Payne WS. Gross and microscopical blood supply of the trachea. Ann Thorac Surg. 1977;24(2):100-107. Li J, Xu P, Chen H. Successful tracheal autotransplantation with two-stage approach using the greater omentum. Ann Thorac Surg. 1997;64(1):199-202. Swisher SG, Deford L, Merriman KW, et al. Effect of operative volume on morbidity, mortality, and hospital use after esophagectomy for cancer. J Thorac Cardiovasc Surg. 2000;119(6):1126-1132. McNeer G, Bowden L, Booner RJ, McPeak CJ. Elective total gastrectomy for cancer of the stomach: end results. Ann Surg. 1974;180(2):252-256. Schneider P, Trainer S, Schirren J, Vogt-Moykopf I. Organ-preserving resection methods on lung tumors. Onkologie. 1996;19(4):290-295. Rose KG, Sesterhenn K, Wustrow F. Tracheal allotransplantation in man. Lancet. 1979;1(8113):433. Nakanishi R, Shirakusa T, Mitsudomi T. Maximum length of tracheal autografts in dogs. J Thorac Cardiovasc Surg. 1993;106(6):1081-1087. Levashov YN, Yablonsky PK, Cherny SM, Orlov SV, Shafirovsky BB, Kuznetzov IM. 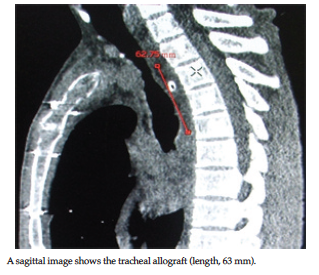 One-stage allotransplantation of thoracic segment of the trachea in a patient with idiopathic fibrosing mediastinitis and marked tracheal stenosis. Eur J Cardiothorac Surg. 1993;7(7):383-386. Delaere PR, Liu Z, Feenstra L. Tracheal autograft revascularization and transplantation. Arch Otolaryngol Head Neck Surg. 1994;120(10):1130-1136. Acknowledgements: The authors thank all people who contributed to the research. The authors have no conflicts of interest to disclose, and there was no funding for this study.